Confused or frustrated by your child’s behavior? Looking for ways to help your child succeed in school and life? Has your family member been diagnosed with an FASD or do you suspect prenatal alcohol exposure? Triumph Today, is just what you need. 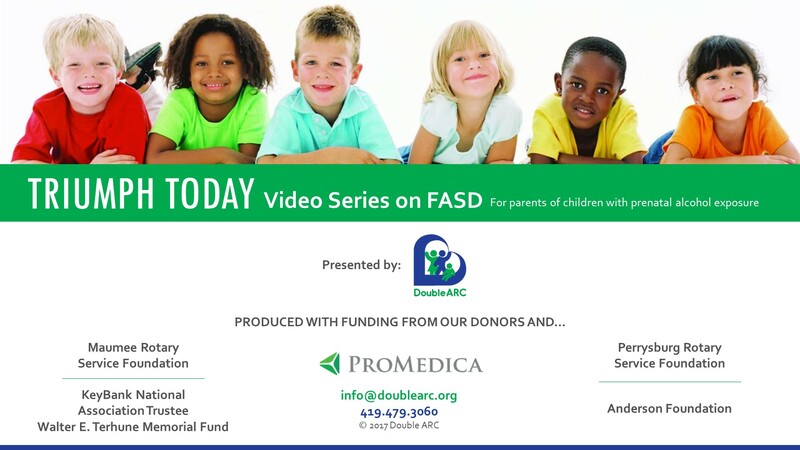 Developed by Double ARC, nationally recognized experts in the field of Fetal Alcohol Spectrum Disorders (FASD), this 16-segment online training series gives you the tools and techniques you need to understand FASD and to help create structures and strategies to bring success to your family member with the disorder. Topics range from a description of the disorder and its impact on the brain, to characteristics and resulting behaviors, to specific techniques to deal with difficult behaviors. Individual segments cover such topics as special education, discipline, meltdowns, technology, planning and how to deal with the many professionals who treat and support your family member. Based on their previous print curriculum developed with funding from the Centers for Disease Control and Prevention (CDC), members of the Double ARC staff and guest parent presenters bring you current information as well as time-tried techniques to assist you and your family member in negotiating the confusing and often stressful path through FASD with success and confidence. The entire staff at Double ARC invites you to browse their website, to view the introductory video and then to join them on the way to success by participating in Triumph Today. This introduction appears on the Double Arc website, a NOFAS affiliate. They have developed this online video series, with funding from their donors and the Maumee Rotary Service Foundation, Key Bank National Association Trustee – Walter E. Terhune Memorial Fund, Perrysburg Rotary Service Foundation and the Anderson Foundation. Please note that the videos are copyrighted material so they are not to be shown to groups without our permission.